Skiing in real powder is actually quite easy, the main difficulty is that we don't get enough practice compared with skiing on the groomed. Therefore our groomed technique is dominant and the problem is that in true powder you are skiing in the snow and not on it . It is three dimensional skiing. So if we break it down all we need to learn in one thing , the 3rd dimension , and not a whole new way of skiing. We covered some of the basics earlier when we were talking about snow, but I will still re-iterate what we covered. Learning form snow boarders is the key to modern powder technique. 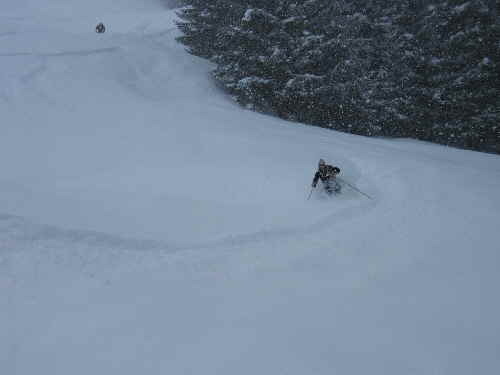 The traditional way to ski powder was to bounce up and down in an energetic fashion doing small radius turns. If we look at a snowboarder they glide in elegant wide arcs with plumes of snow hanging like smoke in the air. We can do the same, interested? The beginning, firstly we need to make our skis into a snowboard by weighting both skis equally. This two ski platform is vital in the deep stuff, if we weight one ski more than another it will sink into the snow and spin us round. So we need to feel the 3rd dimension, skiing at some depth in the powder snow, the faster we go the more we will float the slower we go the more we will sink. Firstly find a nice shallow powder field (or traverse a steeper one) and with your skis a boots width apart and equally weighted, adopt a low wide balanced position. From here push both feet down together, this will compress the snow and create a reaction that pushes you up again. I call this power bobbing. Try to push down using your lower leg and not your upper body, if you bend at the waist too much this will put your weight unnaturally forwards and your tips will dig in (face plant!). Skiing in powder is a slow motion experience due to the sensitivity of you balance if you move to quickly you won't be able to react and you will overcompensate and fall. Once you have mastered bobbing, find a slope that you would be happy shushing straight down, do one push but this time when you come down try to push your tails out to one side a little with a little edge. Hold this in a low position (say for a count of five) whilst you do a gentle turn. For these long radius boarder turns don't pole plant, as this will upset your balance. Now repeat this again in the opposite direction. The key to this technique is not to change direction to quickly and keep your speed up so that you are not to deep in the snow. If you feel that your are gaining to much speed just push you tails a little harder in to the snow. The little bob at the beginning is purely to a way to get both your skis equally weighted before you try to turn. It gives you the feeling of pushing both feet at the same time. Once you have mastered this you can eliminate the pre-bob and just push you heels in. It is vital that you keep your center of gravity over both your skis other wise you will just keel over. In steeper powder when you might need to do more turns try lifting your outside hand in the air (commonly known as milking the giraffe) to help you initiate the turn. This upward motion combined with a downward heal push is more like the traditional power technique but is still useful in the steep and deep. When skiing in powder keep you chin up and looking forwards as this will stop you leaning forwards, also adopting a low wide position will help combat the resistance on the front of the boots from the snow. Skiing in real powder is a wonderful feeling and is easier than you think, it’s just a mater of getting used to not looking at your skis and using more feel. Another good powder technique that can really help you with the initiation of the turn is foot trusting. This is where you push both of your feet forwards together to initiate your turn. This does two things firstly it makes sure that your weight is spread evenly across both feet and secondly it causes you to lift slightly during the initiation of the turn which in turn helps you turn your skis, a bit like an advanced version of bobbing. One problem that can ruin a good run is that as you ski further down the mountain the snow can change without you really noticing. 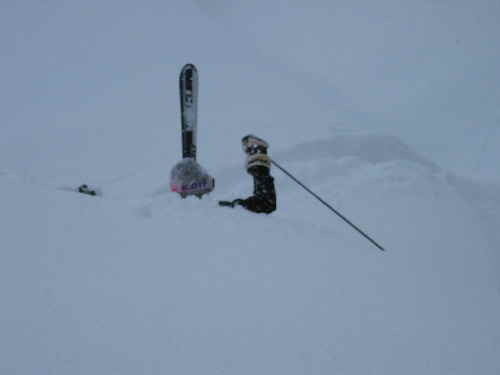 It’s worth thinking about this at the top of any powder field, real powder only occurs when it is very cold and dry, as you loose altitude the temperature rises and before you know it you are skiing in CRUD. Therefore you will need to modify your technique dynamically as the snow condition changes. I used to think that I was just getting tired but really the snow had changed, all I needed was to use the crud technique and enjoy a different kind of ride. One last fun technique (with is a very old one) is the lean back and flap technique, almost forgotten this used to be an official powder technique. This is great if you are worn out and just want to get out of there. Simply put your arms out wide get low and lean back, the fronts of your skis will point up out of the snow at an angle and you will cruse in a straight line with very little effort. You can also try this on the piste for a bit of fun, you may look silly but it will have you in stitches. That what it’s all about, FUN! 1) Avalanche Transceiver – This is an electronic beacon that will enable someone (who also has a transceiver) to locate you if you are buried in an avalanche. These are available to rent in most resorts. But do learn how to use it first as they are not straight forward, even the new digital ones. 2) Shovel – This goes hand in hand with the transceiver. When you find the victim you will have to dig them out. In one report it said that in order to dig out a victim that was only one meter below the surface to a point where CPR could take place takes about 40Mins. with the hands and skis. As opposed to 8Min. with a shovel. 3) Avalanche Probe – This is a metal probe that when assembled is about 2M long. This is used to find the exact spot where you need to dig. There is no point in any of this equipment if you don’t know how to use it, or if you and your ski buddy are both caught in the same avalanche. It is obvious that you should never ski off piste alone, but equally as important is that you ski one at a time, who else is going to rescue you. You have 95% chance of survival if found within 5 minuets this goes down to 50% at 30 minuets and 15% at 45 minuets. Going for help is not a real option, self rescue is you only chance, by all means send for help as well but don’t have this as your only option. Nuff said. OOOps didn’t see that hole!